...again. 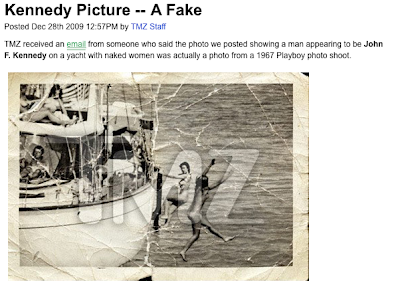 This time they scooped the world on JFK captaining a nudie cruise. Once they finished congratulating themselves, Harvey Levin, Attorney at Law, and his well-coiffed minions quickly decided they'd been duped. Of course they haven't taken down the original story. Next up, TMZ does a book report on the Hitler Diaries, searches their freezer for Walt Disney and determines cereal crumbs found are actually remnants from when Mikey (of the Life Cereal commercials) blew up after dining on Pop Rocks and a can of Coke. Whoops. They call it "Fact Checking" for a reason. Perusing TMZ while at work makes me look occupied.